Almost two years after the Ferrari had been issued another more modern-looking racing car is added to replace the very ageing Vanwall, BRM and Lotus. This is the Lotus Climax and gets an F1 added to its name. 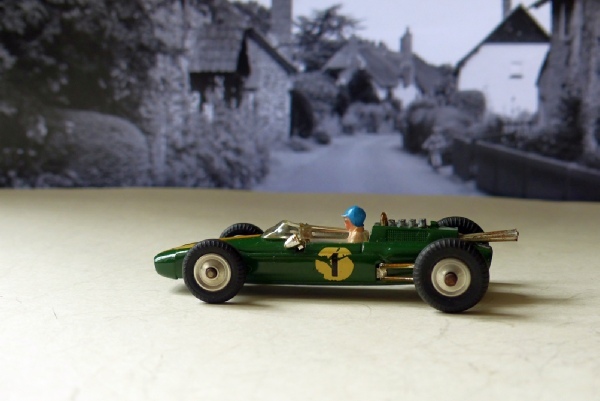 Always in British Racing Green and with RN 1 and with a blue-hatted driver, this is an attractive model with detailed chrome suspension arms, engine and exhaust. The rear tyres should be larger than the front, as on this model. This one is in excellent condition with just the damage to the RN decals to fault it. The paintwork is lovely and most of the chrome is there.